I Am Roses is having a contest, yay! for all the details on how to enter. I can't find the video for the roses on the flip flops-help! They are beautiful. Love the colors you chose. Very original work. It's very pretty. What a great combination - a birdhouse and a mini! With I Am Roses to top it all off!! WoW! I am speechless! 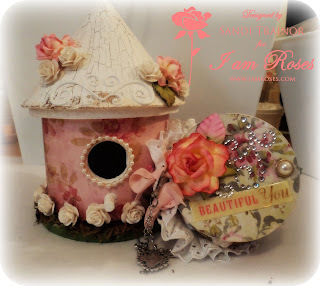 I love the birdhouse and love that mini! Outstanding work! thank you so much for sharing! Very beautiful bird house and mini. speechless, no words, stunning, TFS! OMG this is super cute, very pretty. GREAT JOB!!!! you work is Beautiful !! !